An epic battle of tuned Nissan GT-Rs is both thrilling and ridiculously dangerous. ThatRacingChannel has just posted a ludicrously cool video of five tuned Nissan GT-Rs taking turns going head-to-head on some public roadways. Each GT-R has been tweaked for serious power and these supercar-killers are some of the best of the best on the roadways today. First up is the TRC e85 GT-R by HP Logic, complete with downpipes, midpipe and air intakes. Tuned by Jack Cecil, the TRC GT-R puts out 575whp and 580 lb-ft of torque at the wheels. It takes on the SIR EcuTek e85 GT-R with 630awhp thanks to downpipes, midpipe and intakes. 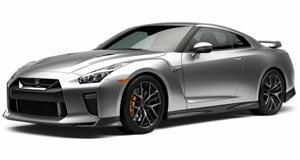 The next two GT-Rs have been tuned by HP Logic, with one sporting 585awhp and the other running with upgraded turbochargers and 93 octane fuel. The final GT-R is also an e85 tuned by SIR EcuTek with open downpipes. All five Nissan GT-Rs look terrific on the road and they feature some ridiculous power. Hopefully the fellers over at ThatRacingChannel ran these bad boys on closed streets, as these races (especially the last) reach some serious speeds.